Note: this is just starter... check back later as I finish this as I can with edits. * CensusPlus UI elements all updated to include variable background transparency and are moveable but not resizable. * All text strings have been enabled for localization. new translations are needed and reviews of other translations are requested. 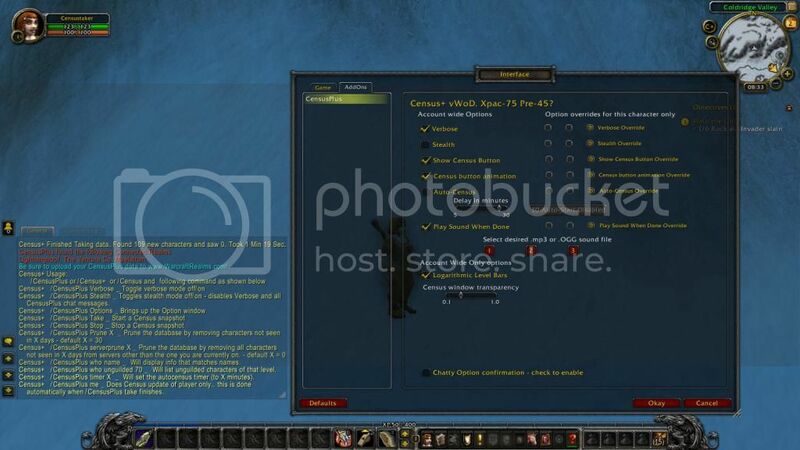 * Option settings are now via the Blizzard Interface Options window. There are now three levels of option settings: Account Wide, Current Character overrides, and command line temporary changes. Above Showing Character sub-window when a realm is not selected. Below Showing Character sub-window when a realm IS selected. Note the fully relocatable CensusPlus button now shows the second level in the latest /who request sent to the server. Your normal settings are done in the first column (Account Wide). The Timer slider is only valid after selecting Auto-Census, and the button to the right of the slider is only for information display. Maximum timer setting is 29 minutes the default 30 is used internally as a disable marker. At a timer setting of less then 16 minutes this button changes color to indicate addon will start census on login of character instead of waiting for the timer delay to expire. I have added the ability to play any of three different sound files to indicate census completed. Only file 1 is supplied, 2 and 3 are user supplied. You must enable sound playback then select your sound file number. Blizzard allows either MP3 or Vorbis OGG sound files. CensusPlus will attempt to play the OGG if it exists or the MP3 or will be silent if neither exists. The last three options are only Account wide. The last one is there if you get confused as to how you have changed options.. when enabled it will blast chat data on every Blizzard Interface change. The DEFAULTS, OKAY,CANCEL are Blizzard standard functions. OKAY to save changes. The Options Override radio buttons [ON, OFF, Remove] modify your options for the current character only. The same mutually exclusive and implied conditions apply. Overriding Auto-census requires setting the timer again ditto with Play Sound and sound number. The old command line options now only work as temporary overrides. They don't impact the option settings only the current actions of CensusPlus. These temporary overrides will cease on opening the Blizzard Interface option window for any reason, or on character log out.